Four clubs are now just one step away from the thrill of appearing at The 02 in London at the season climax, after the line-up for the 2018 BBL Play-Off Semi-Finals was confirmed. Next weekend will see 2017 BBL Play-Off winners Leicester Riders continue the defence of their crown when they match-up with a Bristol Flyers side who have reached this stage for the first time in their history. The first leg will take place at the WISE Arena on Friday 11th May in a 7.30pm tip, with Riders hosting the second leg at the Morningside Arena on Sunday 13th May at 5pm. The winners of that tie will face either London Lions or Glasgow Rocks at The 02, with the former breathing a huge sigh of relief after their epic Quarter-Final duel with Worcester. Lions will play the first leg at home on Thursday 10th May at 7.30pm, with Rocks welcoming their opponents to the Emirates Arena on Sunday 13th May at 5pm. 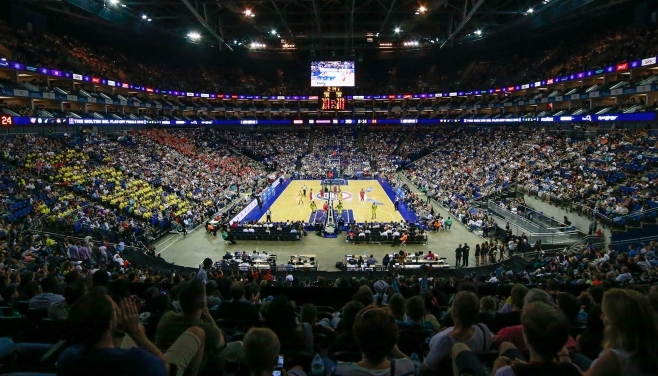 The British Basketball Play-Off Finals will take place on 20 May. tickets can be purchased HERE.